When my son was about eight months old, I felt frustrated that there weren’t books I could read to him, in my lap, with things we could do together, like learning to clap hands. He loved to look at pictures in books and try to interact with them. So I decided to write my own series of board books, that parents or big sisters or brothers could do with little ones in their laps. 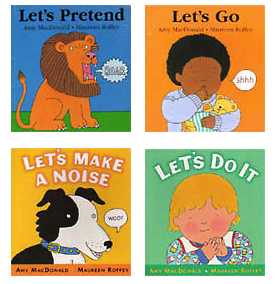 The Independent newspaper in England put Let’s Do It and the others on its list of 10 Best Books for Babies of the 20th Century. Amy–How do I order your board books? I was trying to see if I could order them here, but maybe I need to go to Amazon? Why don’t you tell me what you need and I’ll send some to you. You can send me a check. The board books have been out of print for a LONG time but I have a few boxes in my attic to sell when I do school visits. I would like to buy a copy of your books. They are great for my work as a speech therapist with little children. My present copy is worn out and Amazon only has very worn copies. They is a real lack of books with simple pictures like this on the market.